This Ruban Art Nouveau design 2 light Tiffany table lamp is stunning, washed in amber beige glass and flowing ribbons of deep red and crimson colours. Each piece of glass in this shade has been hand crafted to create a wonderful, high quality feature table lamp. It features a beautiful blend of vibrant colours, clear, translucent and rippled glass that will shimmer when illuminated. Supplied with a detailed antique finish base, fitted with two individual pull chain switches. 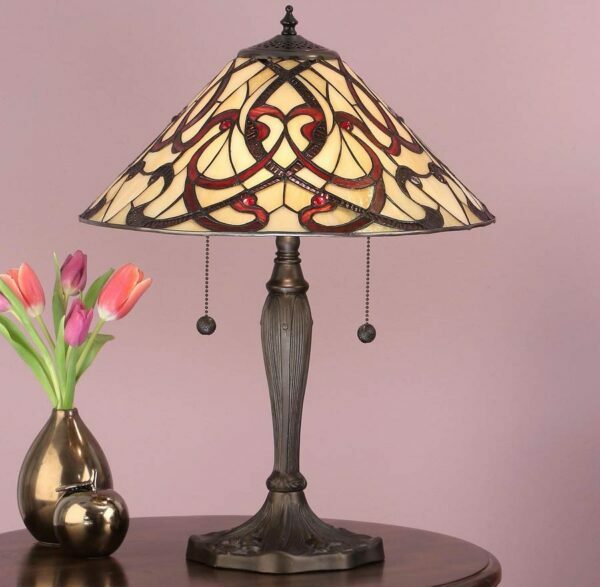 With an array of bold colours and different glass finishes in the design, this Art Nouveau inspired Tiffany table lamp is quite simply stunning. The Ruban Tiffany table lamp is a stunning work of art, brought to you by Interiors 1900.